Two families are now homeless after their corrugated iron and timber house was destroyed in a fire yesterday. 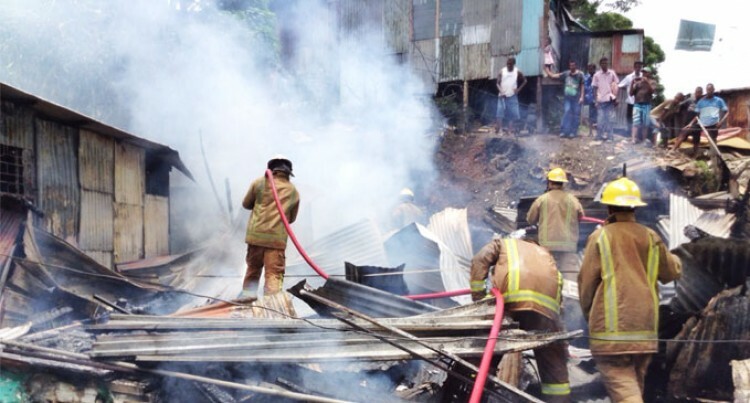 The blaze completely destroyed the two flats at Lagilagi Settlement in Jittu Estate, Raiwaqa, Suva. There were no casualties. Property owner Rajpati, 64, said she was inside her three-bedroom house when she saw smoke coming out from the second flat. “I heard my neighbours screaming at me to come out of my house. I was scared. It was a terrible experience,” Ms Rajpati said. She lives with her two sons, daughter-in-law and granddaughter. Ms Rajpati could only look in despair and watch their home burn down. Tenant, Ranjeeta Devi said her husband was at work and she was in town with her son when she learned that her two-bedroom house was on fire. “When I reached home, I saw everything engulfed in flames and nothing was left,” Ms Devi said. National Fire Authority chief executive officer John O’Connor said the house contained three flats that were attached, and occupied by three families. “The fire teams saved one flat while the other two flats were destroyed as the fire spread quickly due to the very strong winds and the fire load in each flat,” Mr O’Connor said. He said investigations were underway to determine the cause of the fire.